Iowans who are buying gifts for themselves or others on this Cyber Monday are being reminded how to avoid having their holiday packages ripped off after they arrive at your door in a few days. Postal Inspector Dave Margritz, in the Omaha-Council Bluffs office, says you shouldn’t leave packages sitting outside for too long. 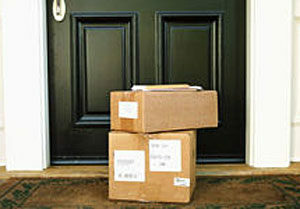 Margritz suggests you leave a small note on your door, directing the carrier to leave the package out of sight or with a neighbor. “A small note wouldn’t be visible from the street, so it’s not like a potential thief would see the note and go up and read it,” he says. “You can have a conversation with your carrier or call your delivery supervisor at the station that delivers your mail to let them know where you want packages left.” Margritz says some Iowans have invested in small home security cameras which are a big help in the investigation of package thefts. “A lot of times, those are really clear videos and we might know the person if they’re a recidivist or we can help identify them,” he says. “If you have the ability and wherewithal to buy a camera system and install it, and have it pointed at your porch or front door or wherever a package may be left, that’s an incredible investigative lead, if something bad does happen.” He says holding all your mail while you’re away from home is another option. Learn more at usps.com.